Todd has been with the company since 2008 and his background is in the marine and auto industries. Todd estimates and schedules work at our NH facility. He schedules service calls and deliveries of consumable products. 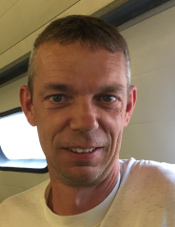 Todd is also our phone support technician and is often times the liaison between the engineers at FINN and the customer or our mechanics to help resolve unforeseen mechanical failures. He works at our headquarters in Pittsfield, Maine and can be best reached @ 1-800- 451-8838 or service@hydrograsscorp.com.